WASHINGTON (CNN) -- The global economic slowdown is so severe that the worldwide economy will contract for the first time in 60 years, the International Monetary Fund says. The IMF has published a gloomy scenario of the first global economic contraction in 60 years. The total of goods and services produced around the world is projected to slump by 1 percent in 2009, compared with a 3.2 percent growth rate the year before. Leading the slump will be the world's most developed economies, including the United States, Europe and Japan. Japan's economy is forecast to shrink by 5.8 percent in 2009, while Europe's is expected to decline 3.2 percent and the United States' 2.6 percent. "The turnaround depends critically on more concerted policy actions to stabilize financial conditions as well as sustained strong policy support to bolster demand," the IMF said. iReport.com: How is downturn hitting you? The IMF thinks the world's emerging and developing economies will continue to grow this year, but by no more than 2.5 percent, after a 6.1 percent growth rate in 2008. 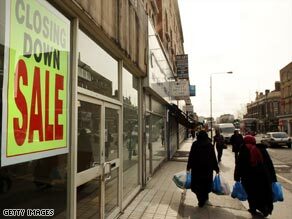 Global economic recovery won't come until 2010, according to the IMF report. The world's economic powers will struggle to break even in the new year, while developing nations' economies will surge by up to 4.5 percent.